In my recent post, I Love My Amazon WorkSpace, I shared the story of how I became a full-time user and big fan of Amazon WorkSpaces. Since writing the post I have heard similar sentiments from several other AWS customers. Hourly WorkSpaces – You can now pay for your WorkSpace by the hour. Expanded Root Volume – Newly launched WorkSpaces now have an 80 GB root volume. Let’s take a closer look at these new features. If you only need part-time access to your WorkSpace, you (or your organization, to be more precise) will benefit from this feature. In addition to the existing monthly billing, you can now use and pay for a WorkSpace on an hourly basis, allowing you to save money on your AWS bill. If you are a part-time employee, a road warrior, share your job with another part-timer, or work on multiple short-term projects, this feature is for you. It is also a great fit for corporate training, education, and remote administration. AlwaysOn – This is the existing mode. You have instant access to a WorkSpace that is always running, billed by the month. AutoStop – This is new. Your WorkSpace starts running and billing when you log in, and stops automatically when you remain disconnected for a specified period of time. A WorkSpace that is running in AutoStop mode will automatically stop a predetermined amount of time after you disconnect (1 to 48 hours). 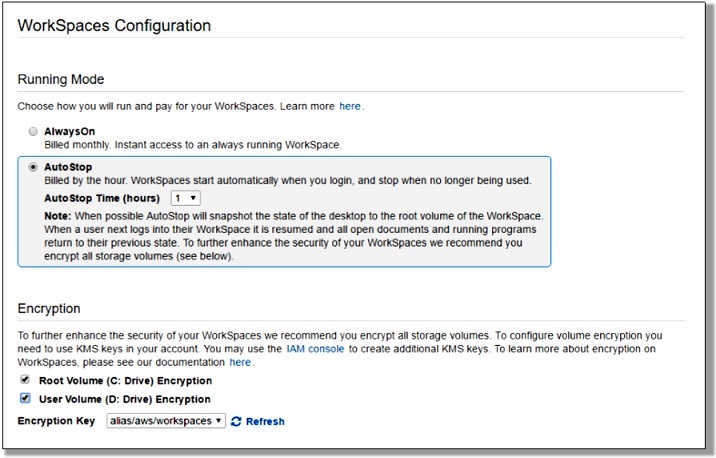 Your WorkSpaces Administrator can also force a running WorkSpace to stop. When you next connect, the WorkSpace will resume, with all open documents and running programs intact. Resuming a stopped WorkSpace generally takes less than 90 seconds. The Administrator can change the AutoStop time and the running mode at any point during the month. They can also track the number of working hours that your WorkSpace accumulates during the month using the new UserConnected CloudWatch metric, and switch from AutoStop to AlwaysOn when this becomes more economical. Switching from hourly to monthly billing takes place upon request; however, switching the other way takes place at the the start of the following month. All new Amazon WorkSpaces can take advantage of hourly billing today. If you’re using a custom image for your WorkSpaces, you’ll need to refresh your custom images from the latest Amazon WorkSpaces bundles. The ability for existing WorkSpaces to switch to hourly billing will be added in the future. To learn more about pricing for hourly WorkSpaces, visit the WorkSpaces Pricing page. By popular demand we have expanded the size of the root volume for newly launched WorkSpaces to 80 GB, allowing you to run more applications and store more data at no additional cost. Your WorkSpaces Administrator can rebuild existing WorkSpaces in order to upgrade them to the larger root volumes (read Rebuild a WorkSpace to learn more). Rebuilding a WorkSpace will restore the root volume (C:) to the most recent image of the bundle that was used to create the WorkSpace. It will also restore the data volume (D:) from the last automatic snapshot. Getting Started – Our WorkSpaces Getting Started page includes a new step-by-step WorkSpaces Implementation Guide and other handy documentation. Recorded Webinar – Late last month my colleague Salman Paracha delivered the Intro to Amazon WorkSpaces webinar. Watch it to learn how WorkSpaces can be used to support a diverse and dynamic global workforce and improve your organization’s security position while providing users with a familiar and productive desktop experience. Whitepapers – Our new Best Practices for Deploying Amazon WorkSpaces whitepaper addresses network considerations, directory services for user authentication, security, monitoring, and logging. The Desktop-as-a-Service whitepaper reviews the greater operational control, reduced costs, and security benefits of WorkSpaces. Case Studies – The Louisiana Department of Corrections and Endemol Shine Group case studies will show you how AWS customers are putting WorkSpaces to use. The features that I described above are available now and you can start using them today!